An important part of ND Energy’s mission is to support energy-related education and outreach throughout Notre Dame and its surrounding communities. The third week of April offered three opportunities to interact with students and the public to spread the word about energy research at Notre Dame. May was filled with excitement as we congratulated our Energy Studies Minor graduates and Mishawaka High School interns on successfully completing their respective programs. On Thursday, April 20, the Alumni Association held its annual Leadership Conference on campus. 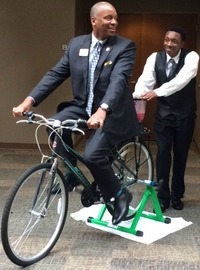 ND Energy welcomed participants with an opportunity to interact with group members from four different ND Energy-affiliated laboratories and to test their physical endurance by pedaling their way to a scrumptious smoothie on the ND Energy smoothie bike. ND Energy research participants were Gary Beane, Hartland laboratory in Chemistry; Michael Humbert, Maginn laboratory in Chemical and Biomolecular Engineering; Tyler Spano, Burns laboratory in Civil & Environmental Engineering & Earth Sciences; and Hunter Ford and Laura Merrill, Schaefer laboratory in Chemical and Biomolecular Engineering. Christopher (Chris) Simms (’88) President-Elect of Alumni Association Board even took time out to show his support and gear up for the smoothie taste test! On Friday, April 21, GreeND hosted its bi-annual Sustainability Festival on campus. ND Energy again used the smoothie bike to draw in the undergraduates and tell them about the Energy Studies Minor and ND Energy’s Student Energy Board. GreeND is a student club whose mission is to “promote environmental awareness and sustainable practices throughout Our Lady’s University through events, meetings and outside resources.” To learn more about GreeND, visit gogreen.nd.edu. The largest event of the week was South Bend’s March for Science on Earth Day, Saturday, April 22, with over 1,100 citizens attending. Among the exhibits at the end of the march was the ND Energy table that provided a solar charging station for phones and other electronics, as well as information about government sponsored research programs in energy at Notre Dame. ND Energy celebrated 22 graduates this year who completed the requirements for the Energy Studies Minor. A reception and certificate ceremony was held in the Atrium of Stinson-Remick Hall on Friday, May 19. The graduates and their families and friends were greeted by Yih-Fang Huang, senior associate dean for education and undergraduate programs, College of Engineering, and Peter C. Burns, the Henry J. Massman professor of Civil & Environmental Engineering & Earth Sciences, director of ND Energy, and academic advisor for the minor. The invocation was led by Rev. Terrence Ehrman, C.S.C., assistant director for life sciences research and outreach, Center for Theology, Science, and Human Flourishing. Listed below are the 2017 graduates, their majors, and future plans. Matthew Joseph Colturi, Civil Engineering, Building Technology at Simpson, Gumpertz, & Heger, Inc.
Kathryn Margaret Georgi, Environmental Science, Consultant at Enterey, Inc. The Energy Studies Minor is open to undergraduate students in all disciplines at Notre Dame. The goal of the minor is to prepare students to become successful leaders who understand the complexities of our energy challenges. Students draw from both technical and non-technical resources to learn how to help move our country and the world toward a more sustainable energy future. The minor began in fall 2011 and has grown each year in popularity, as well as in the number of graduates. This year was largest cohort of graduates. Back in spring 2013, Prof. Peter C. Burns, director of ND Energy, was asked how he could better help the community where he lives. His response was, “I could work with the local high school in Mishawaka and get students into ND Energy research laboratories to give them the experience of a lifetime.” And that he did. Guided by ND Energy team members, Ginger E. Sigmon, managing director, and Anne Berges Pillai, education and outreach associate program director, the internship program for students at Mishawaka High School began in 2013 and has grown each year ever since. Engaging up to ten students annually, students have assisted with and learned from 30 different research projects over the past four years, while receiving credit from the high school for their participation. Each fall, these young interns are welcomed into assigned laboratories and begin working on energy-related research projects with graduate students and postdoctoral mentors. At the end of the fall semester, students are assigned an energy topic by Sigmon that they then research and present orally to their peers at Mishawaka High School. During the spring semester, students continue to work on their research projects in the laboratories, and at the end of the semester, present their findings during a poster presentation held at Notre Dame. During the 2016-2017 academic year, nine students completed the fall semester and six students completed the spring semester. These highly motivated students came to campus twice a week for laboratory work and participated in supplemental meetings to share their research experiences with fellow interns and to discuss and learn about current energy topics. 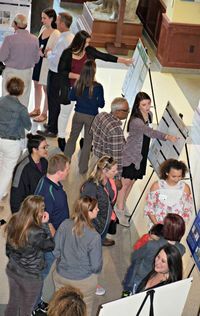 The spring semester wrapped up Thursday, May 25, with poster presentations by the student interns on their research to friends and family members, Mishawaka High School officials, research group members, and others who had an interest in the program. A small celebration was held to honor the participants, including the four seniors, Grace Carpenter, Savonnah Fox, Dev Freet, and Sydney Jablonski. Listed below are the student interns and their projects. Students who have completed the internship program have gone on to study at a wide variety of institutions such as St. Mary’s College, University of Indianapolis, Indiana University, Purdue University, and the University of Notre Dame, to name a few. Over the years, the following faculty members and their research groups have hosted student interns: Peter C. Burns, Jonathan Camden, Kyle Doudrick, Ruilan Guo, Jason Hicks, Amy Hixon, William Phillip, Antonio Simonetti, and Johannes Westerink. Although the academic year has come to a close and most of the students have left campus, ND Energy will continue to spread the word about the cutting-edge research in energy at Notre Dame. In fact, ND Energy is already gearing up for “ND for the Environment”, a joint demonstration with the Office of Sustainability that will take place during the Alumni Association’s annual reunion weekend June 2-4. This display provides an opportunity for alumni to learn more about ND Energy, its mission, and its affiliated researchers and research programs. It also highlights research in energy through hands-on projects, interactive demonstrations, and the ability to generate some physical energy on ND Energy’s smoothie bike and enjoy a tasty refreshment. Originally published by Barbara Villarosa at energy.nd.edu on June 01, 2017.